When Leo Garcia made his debut for the Reds in April 1987, he got the run home, lifting a fly ball to left for a sacrifice. It wasn't his first hit, but it was good enough for some high-fives. If he could reach. Taller teammate Dave Parker went on tip toes, putting the target out of reach, amusing manager Pete Rose. "Funniest thing I ever saw," Rose told The Los Angeles Times the next month. While Rose was unimpressed with Garcia's high-five skills, he was impressed that spring with Garcia's defensive abilities. Garcia made the team that spring, despite the Reds being continually flush with outfielders. The abundance of outfielders was something Garcia tried not to think about. "When I got here, I just got my mind on working hard and trying to make the team," Garcia told the Associated Press. Garcia was originally signed seven years earlier out of his native Dominican Republic by the White Sox. He spent two seasons at single-A Appleton before being traded to the Reds in September 1982. With the Reds system, Garcia made AA Waterbury in 1983 and AAA Wichita in 1984, staying at AAA through 1986. In one game in June 1985, Garcia hit a three-run home run and another sacrifice fly to lead Denver to a win. His 1987 stint with the big club lasted for 31 games. He posted a batting average of .200. For 1988, Garcia returned to Cincinnati for another 23 games, posting a lower batting average of .143. It was his final time in the majors. He stayed with the Reds system at AAA Nashville in 1988, then jumped to the Tigers system at AAA Toledo for 1989. It was back with the Reds system for 1990 and 1991, then a final year in affiliated ball for 1992 at AAA Omaha. More recently, Garcia has been serving as a coach in the Dodgers organization for the club's rookie teams. For 2015, he's listed as coaching at AA Tulsa. 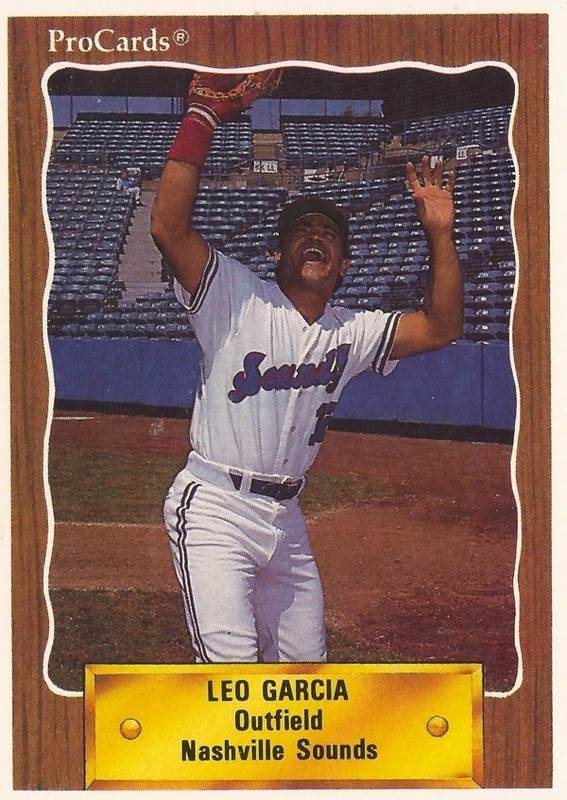 Garcia spent at least part of 1992 through 1998 in Taiwan, playing in both the CPBL and the short-lived Taiwan Major League. Those defensive skills must have made the trip intact as he won a Golden Glove in 1994 & 1995.